TopVue contact lenses have a monthly replacement schedule and are made from hydrogel material and sodium hyaluronate. Thanks to their high-quality stable correction and AQUAMAX technology, they provide comfort and sharp vision all day. TopVue Monthly are comfortable and well-tolerated hydrogel lenses that are fortified with sodium hyaluronate to ensure exceptional moisture and all-day comfort. Sodium hyaluronate, or hyaluronic acid, is a substance natural to the human body. Besides joints and other body parts, it can be found in the vitreous humour of the eyeball. TopVue contact lenses boast very thin edges. The eyelid comes into contact with the lens edge whenever we blink. If the edge is thick, we are aware of the presence of the lens in our eye. Although a seldom-discussed factor, the lens edge is decisive for the comfort of wear. TopVue Monthly contact lenses feature very stable optical correction achieved by the same dioptric power within the whole optical zone. Thanks to this, the lenses provide high-quality vision in any light conditions. 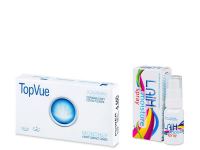 TopVue contact lenses are equipped with integrated UV filters, which help absorb harmful UVA and UVB radiation. However, it's important to note that the lens only covers a small part of the eyeball, therefore it is always advisable to wear sunglasses outside for complete protection. TopVue Monthly contact lenses are not designed for extended overnight wear. At the end of the day, the lenses must be removed from the eye, disinfected, and stored in a case with solution when not in use. They must be discarded and replaced after 30 days. The lenses are made of Polymacon hydrogel material. They contain 38% water, and their oxygen permeability is measured at 26 Dk/t. Good lenses and the price is right. Much easier than buying from my opticians. Quick delivery and very responsive customer service. Overall a great ordering experience. Pleasantly surprised with these lenses. They're comfortable and pleasant to wear. Great discovery. The price is great, compared to other brands I've tried. Easy ordering, and fast delivery from this company. Very comfortable and great price. Can't complain. Nice lenses. I've tried the TopVue daily lenses as well, and they're both great. Highly recommended. Fantastic deal with the 10% off this week. Great time to stock up on lenses - thanks! Tough little lenses.. Better than the Acuvue, and I'm happy to save a bit of money,too. Thanks. Never heard of this brand, but the quality is top notch, and lenses were delivered promptly. Much cheaper than anything my optician offered me. Cheap, but reliable and comfortable lenses. So glad I discovered Topvue! Really comfortable lenses, even for long periods of wear. Don't recommend sleeping in them, but they're not bad for a wearing for a full-day's work. Received these as a gift with my order, and I'm quite pleased so far. I'll definitely re-order these. I also used to wear Acuvue and I've been very satisfied with these. The moneyback guarantee gave me the confidence to try them, but I didn't need to use it. Great quality for monthly contacts. They still feel fresh and clear at the end of the month. Hi there, I´d like to try these lenses. I am used to wear ACUVUE advance but I am not sure whether TopVue Monthly can suit me. Is there a big difference? Thanks! Hello Hannah, TopVue are very comfortable and well-tolerated hydrogel lenses with the addition of an extraordinarily effective lubricant – sodium hyaluronate and the PEG (polyethylenglycol) wetting agent, which ensures extraordinary moisture and maximum all-day comfort. We recommend you to try it and definitely do not be afraid of wasted investment, because we offer a money back guarantee if you are not satisfied. Thank you for your question.